Skye Gould/Business Insider, Michael Seto/Business Insider, Justin Sullivan/Getty Images‘I realised I was being felt out.’ Steve Jobs and Beth Comstock pictured. 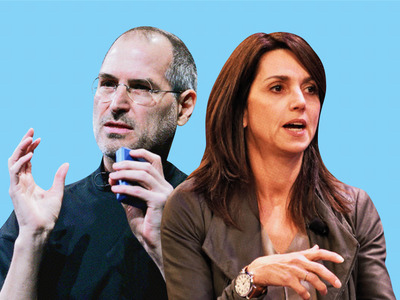 Steve Jobs interviewed former GE and NBC exec Beth Comstock for a job in 2005. Comstock remembers chatting with him for an hour before Jobs offered her the position of general manager at iTunes, which she declined. Jobs then invited her to take a walk with him, after which he offered her to work directly for him, and she turned him down again. As the head of digital at NBC, in 2005, Beth Comstock was responsible for coordinating with Apple to get NBC’s digital content on iTunes. In her new book, “Imagine It Forward,” written with Tahl Raz, Comstock recalls the somewhat surprising turn her relationship with Apple took from there. Cue approached Comstock about working for him, as a general manager for iTunes. For an hour, they discussed projects Comstock had worked on at General Electric (then NBC’s parent company) and NBC. When Comstock said she’d be in San Francisco in two weeks, Jobs suggested that they “take a walk.” Jobs talked about issues around sustainability and asked Comstock to tell him more about Ecomagination, GE’s clean technology business strategy. Jobs used a similar strategy with other executives he was hoping to recruit. Fast Company reports that, in 1997, Jobs interviewed James Green, who was then working for the Walt Disney Company in Asia, for a position at Pixar Animation Studios. Green told Fast Company that the interview took place at Jobs’ home, and felt more like a conversation. Jobs wanted Green to manage the relationship between Disney and Pixar – and Green declined. So Jobs offered Green another position: managing marketing for Pixar’s short film department. Green accepted the second offer, realised during the first week of work that he was essentially doing the job he declined, and resigned a few months later.